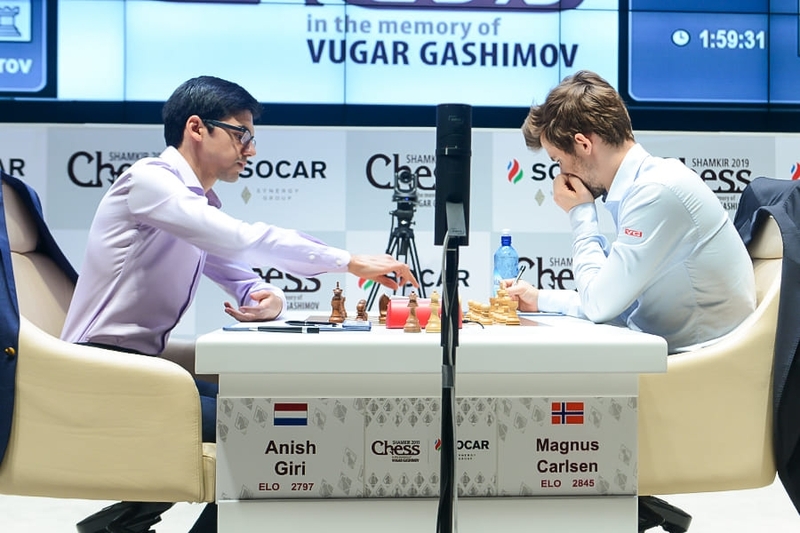 Magnus Carlsen is the sole leader of the 2019 Gashimov Memorial after scoring a brilliant win over Anish Giri in Round 7. 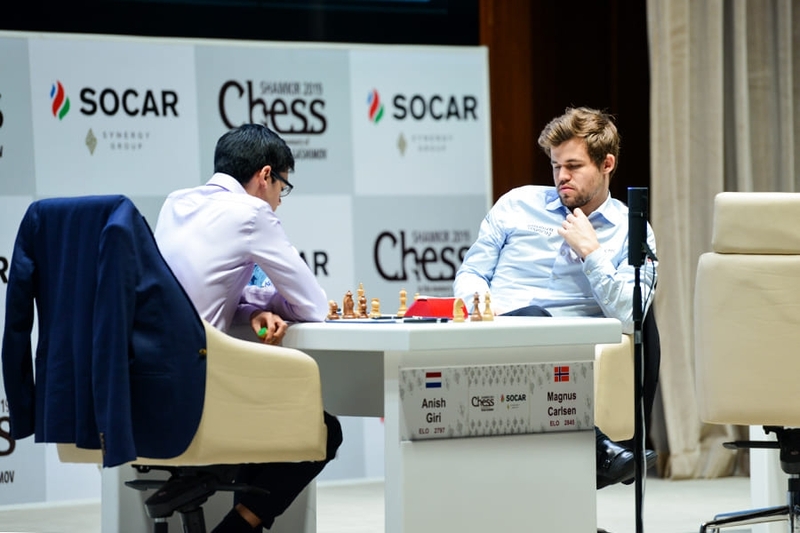 In what seemed a quiet position the World Champion sacrificed a pawn for an attack that quickly became unstoppable, and although Giri avoided losing a miniature he was swept aside in the endgame before losing on time. The other four games were drawn with relatively little incident, meaning everything now rests on Karjakin-Carlsen in Monday’s penultimate round. Carlsen 1-0 Giri: Game of the year? This move Bd6 in hindsight was counterproductive. I was preparing for d4, but then f4 came! He accepted the sacrifice of the e-pawn with 18…Qxe3+, noting, “I saw it’s probably not working, but I’m already desperate at this point”. The curiosity is that to the surprise of the players the computer claims 18…Kh7! is actually fine for Black, though Giri had dismissed it as “just strategically lost”. 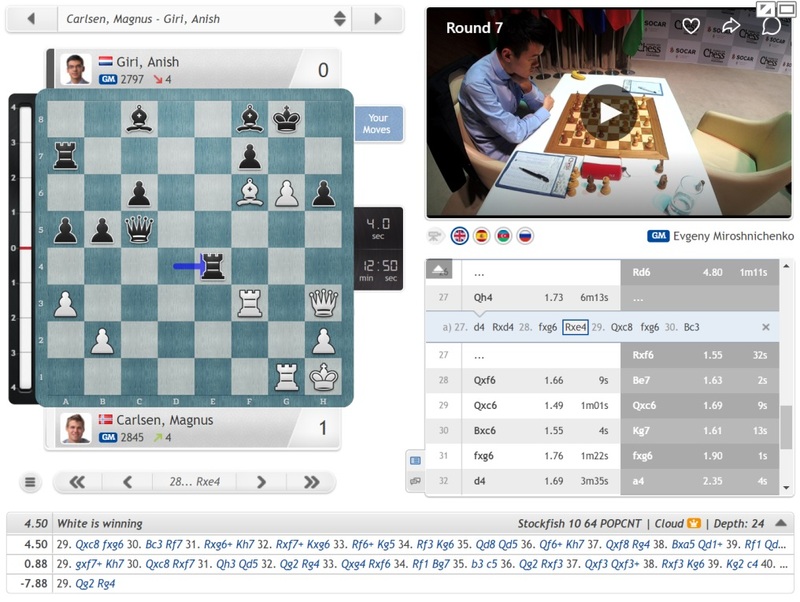 Magnus played 19.Kh1, and one watching French Grandmaster saw similarities to Carlsen’s equally beautiful win over Richard Rapport from Wijk aan Zee this year. It’s too late for 21…f6, which would now run into the crushing 22.Bxf6! The game continued 21…Bf8 22.Be4 Rd5 (Giri was at least putting up a good fight!) 23.Rf3 b5 24.Rg1 Ra7 25.Bf6! As you can see, here only 29.Qxc8! is clearly winning, while the plausible taking on f7 with check might throw away the win. Spanish Grandmaster Pepe Cuenca has analysed the game for us! That win means that Magnus almost losing his no. 1 spot at the start of the year looks like a distant memory now, as on 2853.1 he’s 36.7 points ahead of 2nd place Fabiano Caruana. In Shamkir Magnus is half a point clear of Karjakin and 1.5 points ahead of the rest of the field, so that two draws in the final rounds would mean only Karjakin could still stop him winning a 4th Shamkir title. 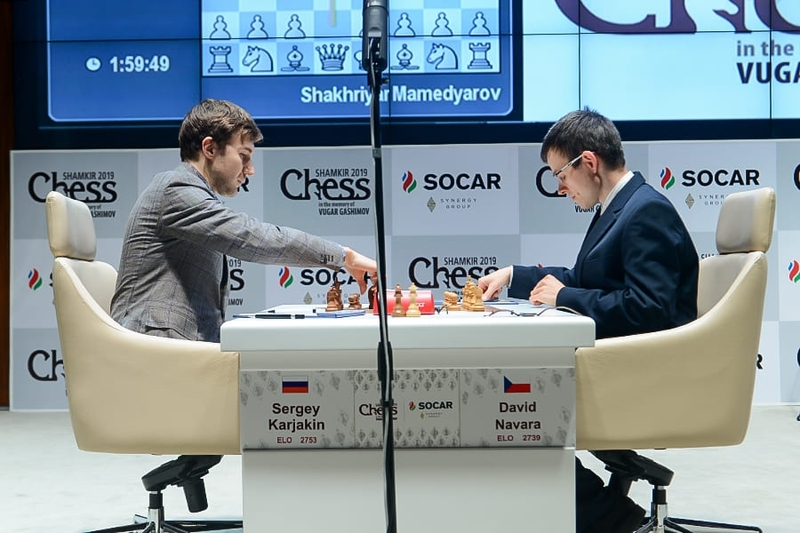 Sergey still has the fate of the title in his own hands, however, since he has the white pieces in their Round 8 clash. The remaining games in Round 7 in Shamkir paled in comparison to that drama. 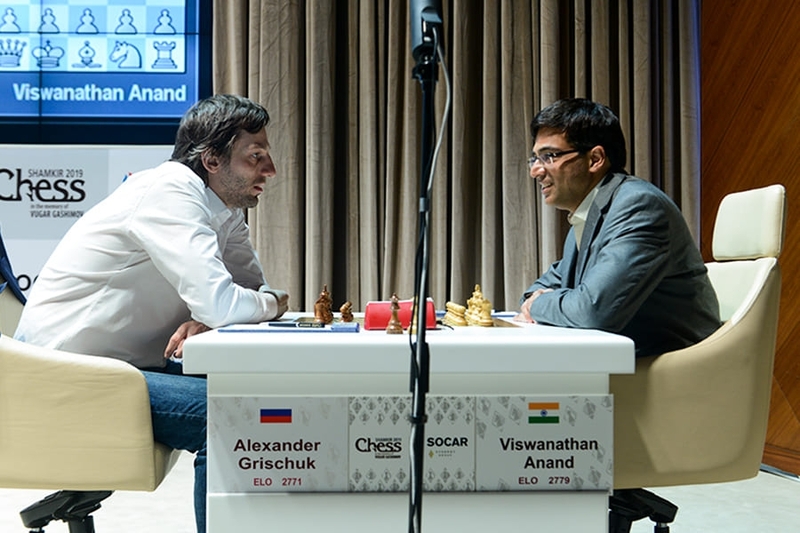 Anand-Grischuk ended first, with Alexander’s novelty on move 15 of an Anti-Berlin (15…Nc5 instead of the 15…Nf6 played by Karjakin, Harikrishna and Giri) only leading to a forced draw. For instance here, it looks as though Black can win a piece, but 17…Qxb5 18.Qxb5 Rxb5 is met by 19.Bc6! Instead Karjakin went for 17…Nxe5 18.Bf4 Bf6 when the computer likes 19.Nd6! for White, happily giving up the b2-pawn. In the game after 19.Nc3 Bb7! the game soon fizzled out into a draw. Radjabov-Topalov was a complex and at times spectacular Scotch Game, but there seems to be no stopping Teimour’s drawing streak in Shamkir, which now stretches to 24 games. He hasn’t won there in 39 games and almost 5 years since beating Carlsen back in 2014. 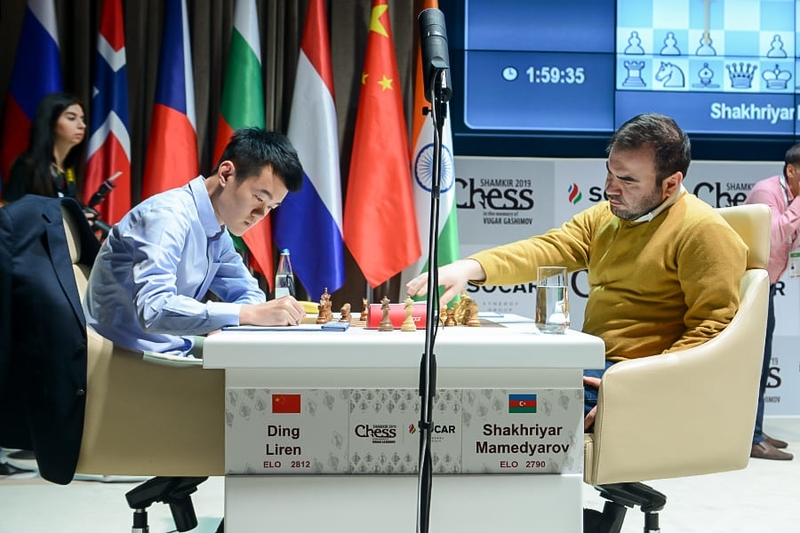 Mamedyarov-Ding Liren was the last to finish. Mamedyarov got Ding thinking on move 6 after employing an opening he’d previously used only in blitz games (over the board and online). Mamedyarov pointed out he loses if he exchanges queens on b5, while if he exchange on c5 it’s just a draw. The game ended with a repetition. Mamedyarov noted afterwards that although he’s a professional it’s been tough to recover from the loss in the game he was winning against Anand in Round 3. He called that encounter, “one of the most interesting of my life”. Monday’s penultimate round sees the big one, Karjakin-Carlsen. 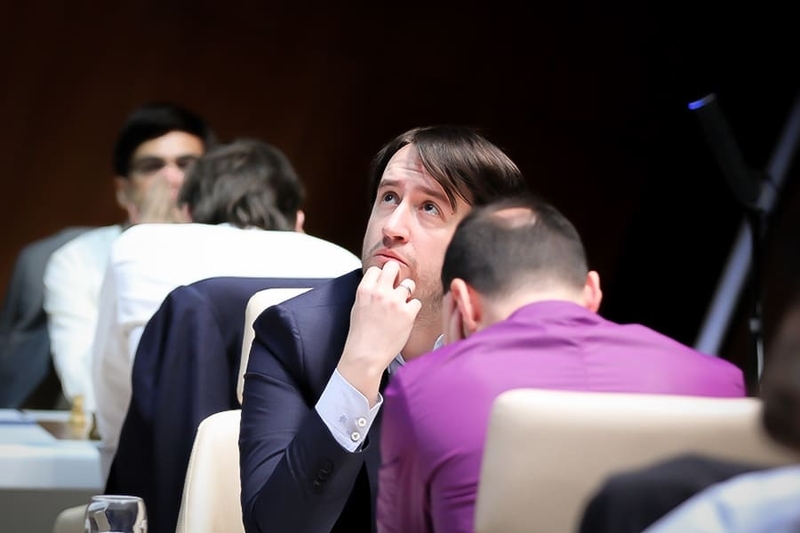 The World Champion knows that draws in his last two games will guarantee him at least a playoff for first place, so the onus will be firmly on Karjakin to play for a win (in the final round he has Black against Mamedyarov). Will he do so? Well, you wouldn’t expect him to burn any bridges if he doesn’t gain an edge in the opening, but he did show in the New York match that he is capable of piercing Carlsen’s defences. If Magnus wins, of course, he's won the tournament with a round to spare. Tune in to all the action from 13:00 CET live here on chess24!